This How-To is based on Kamikaze 8.09.1. First, head over to http://downloads.openwrt.org/kamikaze/8.09.1/ and download the latest firmware for your router. If you are running a Broadcom based router then you probably want to download from the brcm-2.4 directory. This will be a 2.4 kernel and you will be able to use your wireless card. Alternatively, you can also download from the brcm47xx directory which will run a 2.6 kernel but wireless will NOT work. Again, these two directories are for Broadcom based routers. I am personally running a 2.6 kernel that was compiled from the trunk and which is heavily modified for my needs and it is working perfectly with MJMD5 however, this topic is beyond the scope of this How-To. Now you should see the OpenWRT logo come up once you have connected. Now it's a good time to change from telnet to SSH which is more secure and highly recommended. To do this type the following command. Enter in a strong password; if your password is weak the system will let you know like in the picture below. Once you have downloaded putty.exe just enter in the routers IP address in the Host Name (orIP address) field like the picture below and click on the open button. *NOTE* If your ISP assigns an IP to you via DHCP then this step is not necessary. This step is really for DSL users that require pppoe authentication. For DHCP users go down to the MJPROXY SETUP section. But make sure your internet is up and running first. which will bring up the screen below. In order to be able to write into the file you will have to hit the "Insert" key on your keyboard once you have done that you will see at the bottom left hand corner change to "I" instead from a "-" . Now go down to the #### WAN configuration section and make the following changes. Just use your arrow keys to go up and down left to right and backspace. *NOTE* there is a colon ":" in front of quit! This will exit out of the file without saving any changes. Now, continuing with editing the WAN configuration section. These are the changes you have to make. I know everyone loves pictures/screenshots so here ya go. Now, you should reboot your router just to make sure your internet is working. If you have Cable/FiOS that assigns you an WAN/Public IP via DHCP then you should already have internet. You can check to see if your router is on the internet. Just type the following in a SSH terminal. If you get replies then your all good, if you’re not getting any replies then do your normal networking troubleshooting. 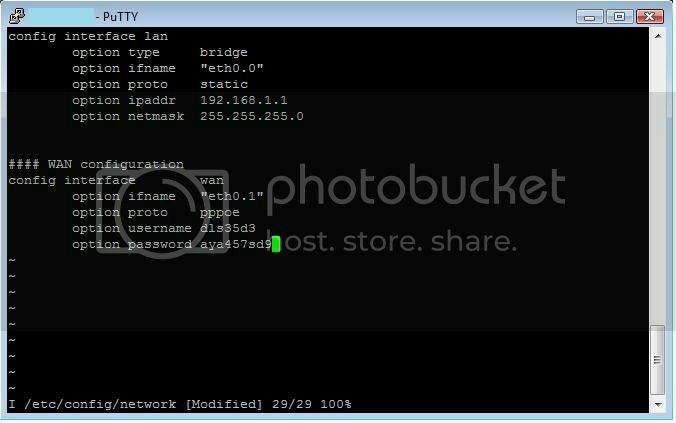 Now, go ahead and log into your router via SSH and make sure you can get unto the internet. Now we need to download the mjproxy binary and make it executable. 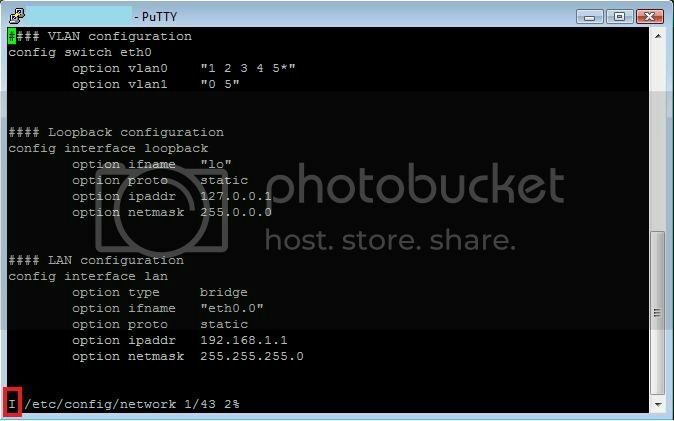 You can download this right to your routers binary directory just issue the following command. This will download the file and put it in your /sbin directory also make it executable and show you your /sbin directory. You should see mjproxy with green lettering like the screenshot below. Now, what we want to do is make sure the service starts every time the router starts up. I have written a small script that can help us do this. Again, issue the following command or cut-n-paste. This will do the following. Enable it so that the service will start up every time the router reboots. if you do a ls on the /etc/rc.d directory you should see S50mjproxy in light blue and you should also see mjproxy in green in the /etc/init.d/ directory. As outlined in the screenshot below. We are almost done here. Now, we need to edit the mjproxy file in /etc/init.d so you can put in your sip password. To do that just issue the following command. And the following screen should pop up. Now just hit the "Insert" key (you should see the bottom left hand corner change from a "-" to an "I" which means you’re ready to edit) and change the data where it says YOURPASSWORD to your sip password and change the proxy server to your local server. Once your done just save and quit. If you want to have 2 ATA's all you have to do is just add your second ATA's password but change the port to 5071. Look at the screenshot below for the example. You should see mjproxy process running if you have two accounts in the /etc/init.d/mjproxy file then you should see two instances of mjproxy. *NOTE* If you are running to ATA's behind the same IP I would suggest you don't use the same proxy servers. I have noticed that sometime when an incoming call comes in it might ring on the wrong line or I should say not the intended telephone. What I have seen that works is just use the next closest proxy server. Some of you might have better idea's on how to do what I did and please by all means share with us. I hope this helps someone get their phone up and running (duh) and maybe learn little about Linux. P.S. I probably made mistakes, if you find any please let me know and I will fix it. HOWTO: Access mjproxy outside your home network using OpenWRT /w DDNS setup. This is a really simple task. But lets make it a little interesting. Most of us have Dynamic IP's assigned to us by our ISP. I know in some cities if you were to reboot your router 5 times in a row you will have 5 different public IP's (Usually DSL Subscribers). This can be a problem if your traveling and your IP changes for whatever reason. Luckily for you, your running OpenWRT !!! Second, log onto your router and type the following. and you see what I have in the screenshot below. Here is the screenshot. Depending on your router this may take 2-5 minutes. Just be patient. Now all you have to do is just edit the configuration file. Type the following command. The following screen should pop-up like in the screenshot below. Just fill in the information you used to sign up with noip.org. Remember to start typing you have to hit the "Insert" key on your keyboard and when you’re done hit the ESC key and type :wq (enter) to write and quit. If you mess up don't worry, just hit the ESC key and type quit! (enter) and it will quit without saving. "OpenWrt user.notice syslog: myopenwrt.no-ip.org: updated successfully"
Now from your router you should be able to ping yourddns.no-ip.org and it should give a reply which should be your WAN interface IP. Now what you can do is update your ATA so that SIP Server IP is yourddns.no-ip.org:5070 instead of 192.168.1.1:5070. After completing the next step you can take your ATA from your home and just bring it with you anywhere plug it into a LAN and start making phone calls. 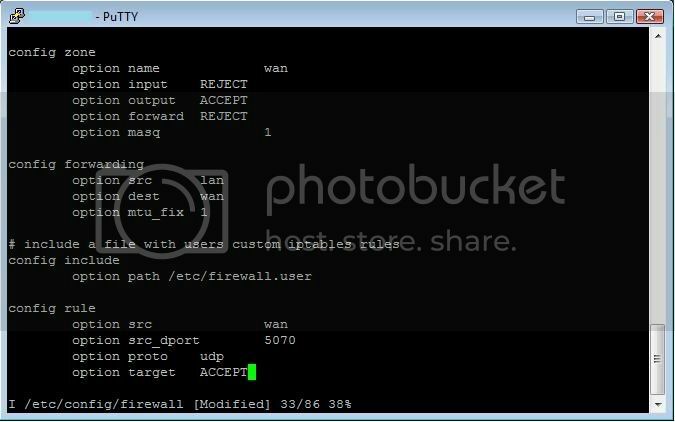 Opening UDP Port 5070 on your OpenWRT WAN interface. This is easy. Just do the following. Remember to edit hit the "Insert" key and when your done hit the ESC key and type :wq to write and quit. If you screw something up don't worry just hit the ESC key and type quit! And it will quit without saving. Now all you have to do is just restart the firewall and you should be good to go. Test out your ATA outside your local area network and it should be good. I am pretty sure you can even use Fring if you have an iPhone. That is pretty cool. Step-by-step... ^_^ Will put it in my favorite. Did everything when I try :wq to save it this is what it said "/etc/init.d/mjproxy" Read-only file system. :wq! (enter) see if that works. If that doesn't work you have to log in as root. type su - (enter) and put in your root password and then try editing the file. or you can try sudo vi /etc/init.d/mjproxy which it should ask you for your root password I don't know if sudo exists on DD-WRT as I don't run it. Hi Thank you for the excellent tutorial, I was wondering what ip to give in my ATA if I wanted to access my phone from outside my home n/w. I know I have to open some ports etc., but I am not sure how to do it. Can someone please tell me how i can accomplish that? I have updated the tutorial and it should help you with what your looking for and more ! and I cna register for multiple domains so I can have multiple mjs running. It should work, I don't see why not. 1. If I want to register multiple 3 MJ's then do i have to register 3 domains? 2. If i run 3 proxies will I need more space JFFS file system as I have only 376 KB left free? 3. I can attach a USB port to my router do u think I can gain more space in the file system by doing so? 4. What will be the performance if I run multiple MJ's? what will my settings be in that tab? I have an ASUS WL-520gU, if that helps, I got this router last week specifically for this purpose. 2. You don't need anymore space. Your just going to run multiple instances of mjproxy on different ports as I stated above. 4. I am running 2 at the same time and I have no problems. My CPU is at 0.00% so if you were to add another one I don't think it will make much of a difference. I am guessing 0.0.0.0 5070 means any IP's can connect on that port. So, *I think* if you were to change that 192.168.1.20 5070 (LANip) or 25.65.84.12 5070(WANip) then only these particular IP's would be able to connect on port 5070. I can be 100% wrong but this is my guess as of now. Please correct me if I am wrong.